I made this project in response to a query on Melody Lane’s Facebook group, which is a fab place full of really supportive crafters! I haven’t specified the size as you can of course resize the files. However, I used standard A4 paper (slightly larger than letter paper if you’re in the US or Canada). Our FREE File – please scroll down to the bottom and fill in the form to get it sent to your inbox in SVG, EPS, DXF, PNG and PDF formats! In terms of your Cricut set-up, you will need to ensure your mat is super-sticky, as the state border areas are extremely narrow. As I used such a heavy cardstock for that sheet, I had my maker set on Cereal Box with the deep cut blade (it always grieves me to use that setting for heavy, quality cardstock, but it has got really good results for me! However – please choose your settings dependent on the paper you’re using! You might have to experiment a bit as it’s quite intricate. 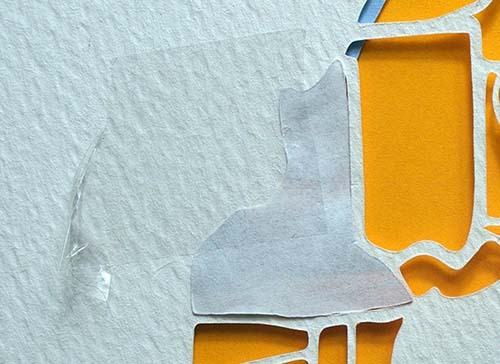 Once you’ve unzipped the files (this is pretty easy on a Mac, but if you’re using windows you might need to use an application like Winrar or Winzip), you need to choose the ones most appropriate for your cutting machine. (There are two files in five formats – I’m using the Cricut Maker so I need to choose the svgs – they’re called USAmapwithstates and USAstates). Import ‘USAmapwithstates’ into Design Space. That’s it! You’re ready to click on Make It! 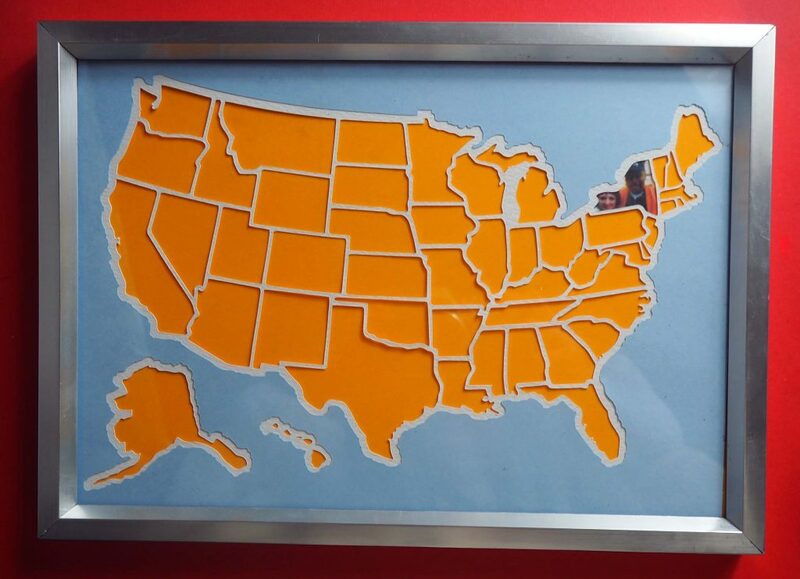 Now….we’ve got the main pieces, but we need to fill the states up with images from our holidays. I’ve only visited two states in the US, so I’ve got a long way to go…but I can at least make a start! 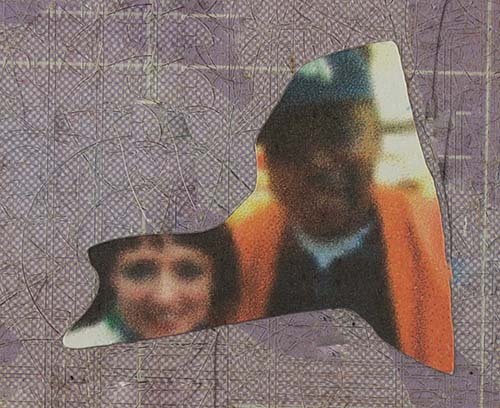 Of course – you can use the bits of paper left over from your initial cut (from the white cardstock) as templates around which you can draw on your photos. But…you can also just Print and Cut them! Open the image (that is, a photo of you enjoying yourself in one of the states of the USA!) it in your vector drawing program (I use Illustrator, but you can do it in the free software Inkscape as well) and open USAstates.svg. Ungroup the file if necessary, and choose the state you want. 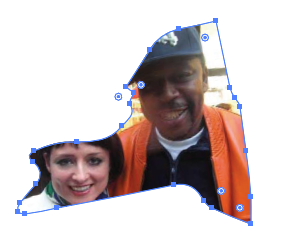 I’m choosing this picture of me with legendary rapper Grandmaster Caz (really! He’s great!) taken in New York State. 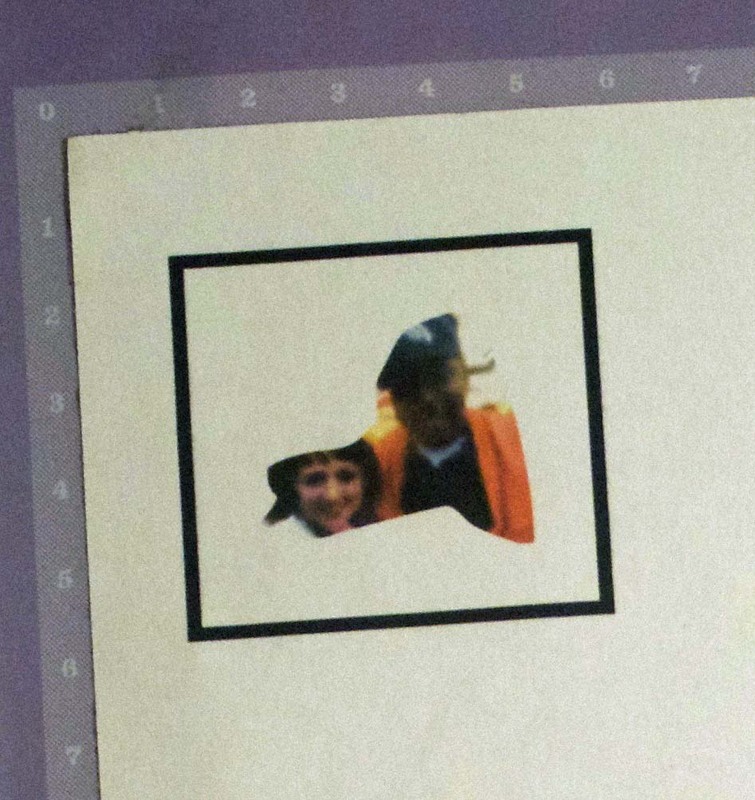 The photo needs to be resized so that it’ll fill the shape of the state – in my case, to get both of our faces, I had to reflect the image and rotate it. 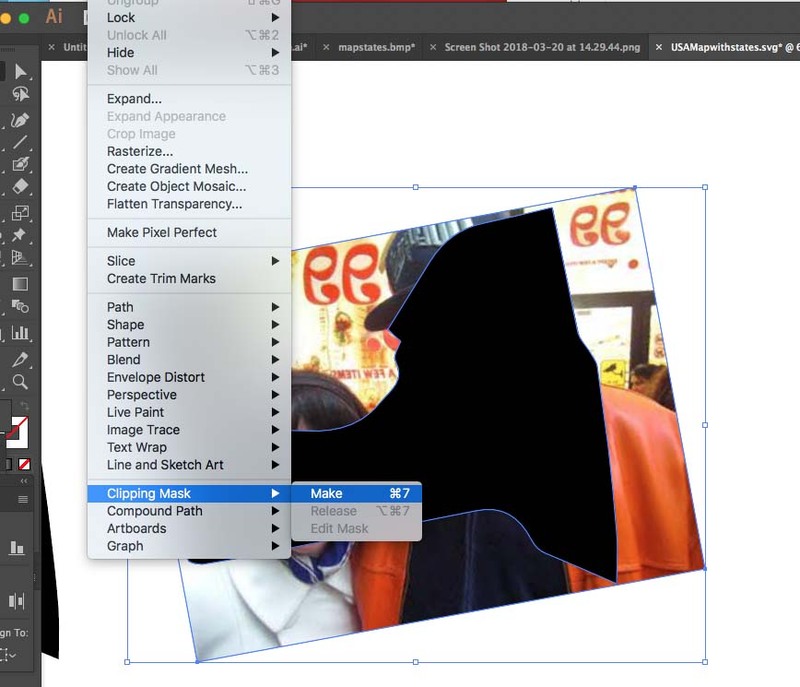 Select both objects (ensure the state shape is in front) and go to Object>Select Clipping Mask>Make (in Illustrator – in Inkscape it’s Object>Clip>Set). Haha…hey, nobody said it had to be flattering! 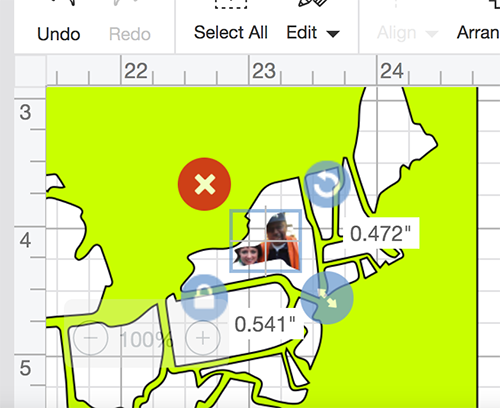 Open a document (make the size larger than the photo you’re posting) in Photoshop (or equivalent photo-editing software) and paste the image you just created – your photo in the shape of a US state! (Choose ‘pixels’ from the flyover box that appears to position it onto the canvas). Save it as a png (this means it’ll save and therefore cut in the shape given, with a transparent background rather than a white square and you won’t have to mess with it too much in Design Space). You can now close Illustrator or Inkscape (or whatever you’re using). Now, you can import this image into Design Space! I would recommend you import it into the same document as the files you’ve already cut out, as it’s likely you’ll have to resize it. As you can see above, when I imported it, it was far too small – you need to resize it so it’ll fit behind its state ‘frame’! 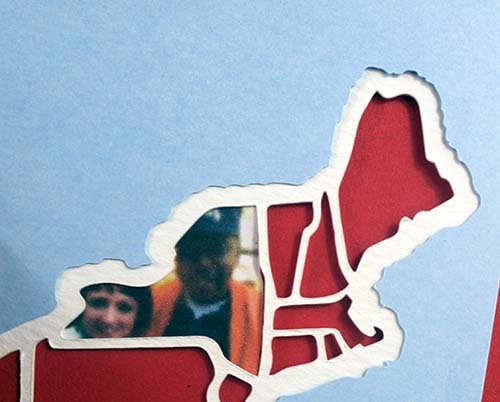 Once it’s the same size as the relevant state, you can Print and Cut. (It’ll send the image to your printer, so you can cut it out). Please forgive the scars on my cutting mat! And please note – this is a VERY low-resolution photo – yours will be much better! Now, all you need to do is attach it behind the section you could with the borders on it. I’ve applied a bit of tape to keep it in place. Make sure it looks right at the front (please note – if the fit isn’t right, then you can always go back and change the size in Design Space as we did earlier). 11. OK…one state down…another 50 to go! Can’t wait to try it! THANK YOU so much for your time!! Thank you so much. I know this took some doing and I appreciate it!!!!!! This is amazing! So glad I found it and thank you for making it and providing such great instructions! Aw you have no idea how lovely it is to read this! I just replied to your other message – hopefully you’ve got the file now, but if not please give me a shout and I’ll make sure I send it to you – thank you Stacey. Really looking forward to tackling this! Thank you so much! Thank you very much for your comment Maria – I hope my instructions make sense and that you enjoy yourself making this up! OMG this amazing , thank you so much for sharing !!! Aw you are welcome Dee! 😀 Hope you make something fantastic with it and tell us how you get on! You are soooo awesome! Thank you!! Haha aw it never hurts to be told that! 😀 Thank you Brigette, hope you enjoy the files! Aw thank you very much, Jill. It was fun to do, and it’s very fun to hear people excited about making it. Hope all the pieces come together well and you make something amazing! Thanks so much for this. Any chance you would do Canada? Thank you for your comment, Colleen! Ooh – well, since my dad was born in Nova Scotia, it would probably be wrong not to! 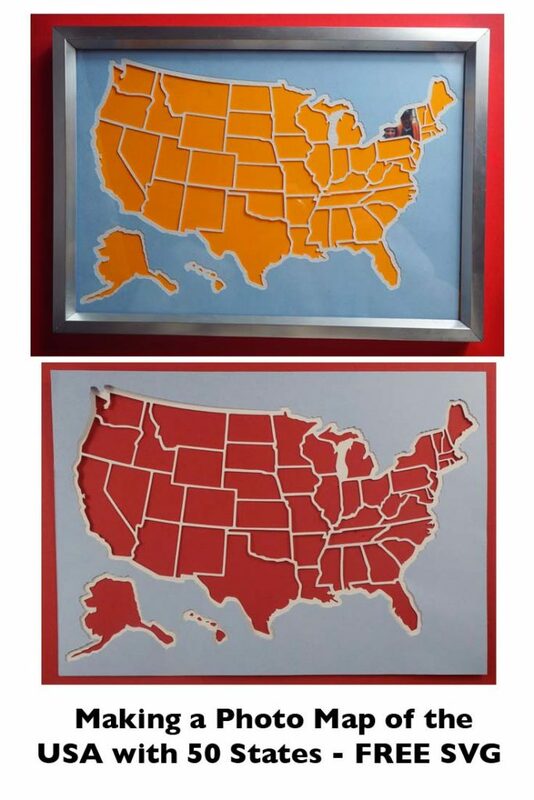 And because Canada is so big, you could probably fit a decent-sized photo in every province! 🙂 I’ll get working on it! Thanks so much! 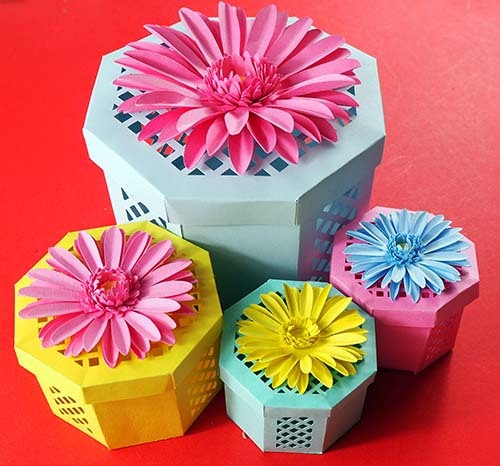 This looks like a great project and a great gift to make for others! Fantastic – you are very welcome! Thank you for your comment Linda, I’d love to know what you make with it! Thank you so much. Excited to give it a try. Thanks again for making this. Can you send the email again, I can’t seem to find the email. Oh no: I’m sorry about this, Debbie. Would you be able to check your spam to see if I’m in there? Otherwise I’m likely to be identified as spam whenever I send an email to anyone using your email provider. Anyway – I will send it to you manually; please do let me know if it doesn’t work. This looks wonderful! Thanks so much for sharing your time and talent! Aw you are welcome, this warms my heart! 🙂 Hope you enjoy using the files Kristy! Thank you so much you did a great job!!! Thank you so much for doing this!! The detailed instructions are great!! Looking forward to making this! Need to find a Canadian one too now! thanks – going to try not too sure how I will do. Thank you so much for your generosity and thoughtfulness! How nice of you. Thank you so much for your generosity and thoughtfulness! Aw thank YOU for your lovely comment which is really lovely to hear! Hope you make something really nice with the files! Aw thank you so much Marshiel, it’s been really fun to do, especially having so much encouragement from people like you – hope you enjoy the files! This is a fantastic idea. Thanks for the idea and image. This is amazing thank you so much for this amazing idea!! This looks like a fun project. Thank you for the files and the instructions. Such a neat project! Thank you so much!! I love it!! I think my grandsons will have a great time designing this with me😍 Thank you. I cant thank you enough for this Awesome project. I have wanted something like this for ever! OMG I LOVE this!!!! Thanks so much for creating it! I can’t wait to start mine! What a great motivator too, to get out and see more places. Thank you so much for sharing and showing us how to use it. Hi Natalie, I think I’m having problems with the email. I checked my spam but didn’t find it. Would you check for me? Thanks again!!!! Thank you. We just retired and hope to do some traveling. This will be fun to do. Thank u for taking the time to do this. Not all of us can do things like this. So thanks to ur skills. Thank you for sharing. I am having problems getting the email. Can you please help me? 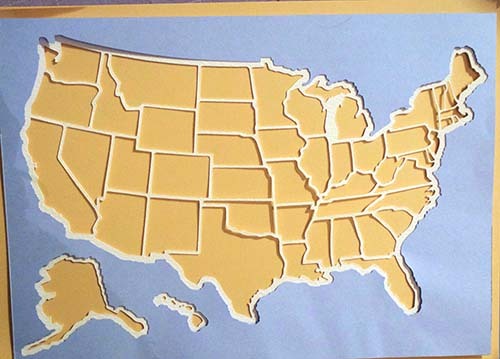 Thank you in advance for the USA map cutting files. I sent a request thru your link in above well written tutorial. What happened to Long Island??? I live there and have to include it! Any advice? Aw sorry about this Christine – wWhen the cutting area is small the edges have to be simplified as it’s a properly ‘zoomed out’ map. I’ll try and get to do a state map with Long Island! 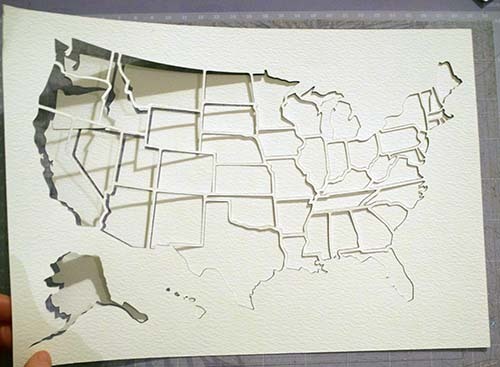 Thank you in advance for the USA map cutting files, thank you for sharing. This would be neat to try! I’m sorry if I submitted 2 requests, I was worried entered my email incorrectly. Thank you SO much for sharing this! I cannot wait to try it!! Hi! 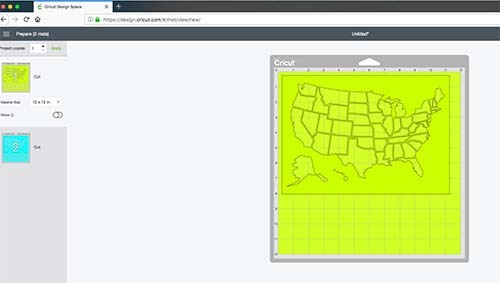 I haven’t received the email with the svg file yet, could you send me the picture state map file when you get a chance? Thank you! Thank you for your message Cat – would you be able to check your spam? As I have probably gone in there. If your email provider has identified me as spam, it’ll likely go in there if I send it again. If I’m definitely not there please let me know though, and I’ll make sure I get it to you somehow! 🙂 (Btw if you got the initial email, you have to click on confirm for the file to be sent to you). Thank you for the awesome file! I have been wanting to do something like this. I also want to add the Caribbean since my family does a lot of cruises as our vacations. You have inspired me to try it now. Just saw this on Facebook. Can’t wait to make it. Oh my go! Thank you so much for sharing you work with us! I not that good with doing things like this and having someone share their work for me to enjoy in my own scrapbooking! Thank you! Thank you so much for sharing your talent and time. I just started doing some traveling in the past few years and this will be wonderful to play with. This is totally awesome! Thanks for sharing your work and file! Thank you so much Elizabeth; comments like this make it a real pleasure to do so! Can’t wait to make one of these maps! Aw that’s great to hear, Sara! Do let us know how you get on with it – hope you have fun! Thanks so much…waiting on my email. Question: I do not have a Maker, I have an Explore One. Would I still be able to cut these same recommended card stocks on my machine?? Thanks…this is going on my list of projects to make. I LOVE it! Thanks for sharing! I would love the svg for the USA map. 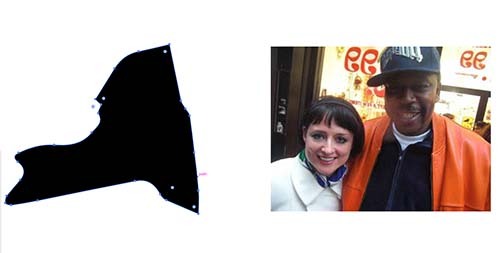 Hello Karen – thank you for your message – the file is here: https://craftagogo.com/projects/creating-a-framed-photo-map-of-the-usa-with-your-cricut-free-svg-dxf-eps-png/ Hope you have fun with it!